We began doing business out of a small office in Massapequa, New York with only one full-time employee. It was the founder, James Stone, who was backed with 25 years of hands-on experience. His prior work as a boiler engineer in the U.S. Navy was what drove him to build a first class air conditioning and heating company on Long Island. This all contributed to our second move to a larger and improved facility. In May 1978, we held a ground-breaking ceremony with friends, employees, local dignitaries, government agencies, customers, as well as media for the building of our brand new and superior energy savings building here in Copiague, NY. On January 1, 1998, Brandon Stone purchased all of the stock of our company from his father, James Stone, and took over the management of All Weather. Our company continues to grow and prosper to this day, thanks to the dedication and loyalty of our long-term employees. 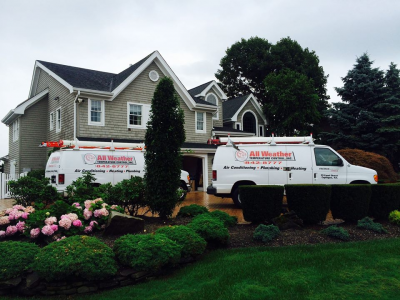 In addition, our ongoing goal is to be the best Long Island heating, cooling, and HVAC company. Lennox’s appliances are some of the most energy efficient models on the market. Because HVAC systems are used so frequently in homes, Lennox has developed theirs to save you the most money on your energy bills. They essentially turn your home into an energy vault while operating quietly and efficiently. We’ve partnered with Lennox to bring this kind of convenience to your very own home with our expert heating and cooling system repairs and installations. That’s why we built and are still housed in our energy savings building, which has a custom-tailored sheet metal shop as well as a state-of-the-art office. This facility allows us to use modern service dispatch and tracking systems that will assure prompt arrival of our technicians at your home or business. Our building in Copiague, Long Island NY, as well as the air conditioning and heating systems we use, are extremely energy efficient. In fact, our current building has produced the lowest annual operating cost and energy consumption of any comparable commercial structure in the metropolitan New York area. That’s how you know that we take energy efficiency seriously. Contact us today to learn more about us or to schedule an appointment.